FILE - South Sudan President Salva Kiir signs a final power-sharing deal between South Sudanese arch-foes, in Khartoum, Aug. 5, 2018. Formation of a transitional government is expected to miss its May 12 deadline. Officials in South Sudan say obstacles in setting up and training a unified army will likely delay formation of a planned transitional unity government. The news came Thursday from the National Pre-Transitional Committee (NPTC), one of the bodies established to help implement a revitalized peace deal aimed at ending South Sudan's civil war. An official from the rebel SPLM-IO says parties to the deal should consider extending the deadline so security arrangements are in place before the next government is formed. In about two months, an eight-month "pre-transitional" period ends. The government and rebel groups are supposed to form a transitional government by May 12 under terms of the peace deal, signed last year. FILE - South Sudan's rebel leader Riek Machar. Martin Elia Lomuro, secretary of the pre-transitional committee, says a lack of money is slowing efforts to bring together rebel and government forces, train them and create one, unified army. Before a new government is formed, Lomuro said, a unified force must be in place. "That is a condition for the establishment of the transitional government. Without that force, the Transitional Government of National Unity will not be formed. And this is important to all the parties to the agreement ... to move all our forces expeditiously to assemble them and move in cantonment so that within the next three months, we can form that unified force," Lomuro told VOA's South Sudan in Focus. Henry Odwar, the NPTC co-chairman and deputy head of the SPLM-IO, agrees. "When are those unified forces going to be trained? Will it take a week? Will it take three months? Thereafter, we think that some of the forces either from the government side or from the opposition side will be left out after the unification and that poses a lot of problems," Odwar told VOA. Odwar said the lack of funds to complete security arrangements on time may lead to forming a government that collapses. 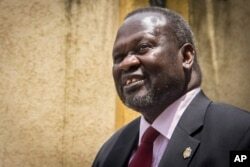 He is urging NPTC members to handle the security arrangements carefully to protect the next government from a repeat of what happened in July 2016, when fighting broke out in the capital, Juba, between government and rebel forces, prompting President Salva Kiir's deputy and SPLM-IO leader Riek Machar to flee the country. "The way is that the principals have to sit down, find out the time required for completing the security arrangements and then extend a dateline to the end of that time," Odwar told VOA. The number of states and their boundaries must also be resolved before the new government is formed. Kiir unilaterally redrew the country's internal map in 2014. Lomuro said delays in resolving those issues are also likely to delay the formation of the new government. "We are waiting for results of the Technical Border Committee to determine some of the tribal boundaries, and then the IBC, the Independent Boundaries Commission, would determine the number of states. ... The time that we have expected for the two committees to work has expired," Lomuro told VOA. Odwar said the opposition thinks all parties should meet around a table now to find a compromise on the number of states. "Do we go back to the 10 states and allow South Sudanese to decide how many states we want during the transitional period? Or should we go along with the former colonial districts because then, we did not have problems?" asked Lomuro. The revitalized peace deal states that if the Independent Boundaries Commission fails to resolve the dispute over the number of states, the matter would be decided by referendum. Odwar said the SPLM-IO does not trust the government to organize a credible referendum, noting, "The referendum will be conducted under the current incumbent government, and it will still have the president as the head of state; the whole security arrangement will still be under him." Under that scenario, Odwar added, the chances of rigging the outcome are "very, very high."